Amaze your friends with your knowledge of the great orange globe! We've got a plethora (I just wanted to use a fancy word for "lots") of information on pumpkins. This information is invaluable for school reports, to amaze your friends on your knowledge and IQ, or just general education and knowledge. I once had an Email from a young lady in Australia, who was looking for the strangest fact or story about pumpkins. She needed it for a local radio station contest, where the winner received a pair of tickets to a "Smashing Pumpkins" band concert. You never know when you will need some of our pumpkin information. Anatomy of a Pumpkin Do you know all the parts!?! Teacher's Page Find lesson plans for your class...... and more! Color Me Pumpkin What color are pumpkins? You might be surprised. Pumpkin Carving Record Just how fast can you carve a pumpkin? Pumpkins Around the World It truly is a small,world after all! Pumpkin Trivia - many interesting facts to inform and amuse. A pumpkin is really a squash. It is a member of the Cucurbita family which includes squash and cucumbers. Pumpkins are grown all over the world on six of the seven continents, with Antarctica being the sole exception. They are even grown in Alaska. The self proclaimed "Pumpkin Capital of the World" is Morton, Illinois where Libby has it's pumpkin industry and plant. 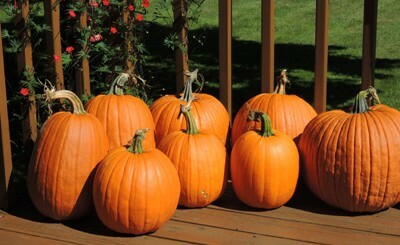 Pumpkins are believed to have originated in Central America. Seeds from pumpkin plants have been found in Mexico, dating back over 7000 years to 5500 B.C. Native American Indians used pumpkin as a staple in their diets, centuries before the pilgrims landed. When European settlers arrived, they saw the pumpkins grown by Native Americans. Pumpkin soon became a staple in their diets, too. The pilgrims also brought seeds back to Europe, where they quickly became popular. Just like today, early settlers used pumpkins in a wide variety of recipes, from desserts to stews and soups. In addition to cooking with pumpkins, they also dried the shells and cut strips to weave into mats. Early settlers made pumpkin pie by filling a hollowed out shell with milk, honey and spices, then baking it.Whether they learned this from Native Americans is not known. Native Americans and early colonists preserved pumpkins by drying them. The skin was peeled and the insides scooped out. The pulp was sliced and placed on drying racks, or hung up to dry in the sun. Halloween evolved, in part, from the Celtic tradition of All Hallow's Eve. Pumpkin carving evolved from the traditions of this annual event. But, it wasn't pumpkins that were being carved in these ancient times. Pumpkins are native to America, and were not known to the Celtic people of Ireland. They carved turnips and rutabagas. There are conflicting reports and documentation as to whether pumpkins were a part of the first Thanksgiving meal of the Pilgrims and the Indians, or whether it was the second Thanksgiving celebration the next year. We do know that pumpkins were a staple of the Indians long before the arrival of the pilgrims. From that time forward, pumpkins have been, and continue to be a tradition at the Thanksgiving feast. Not only is it associated with the meal itself, but the pumpkin has adorned and decorated homes and communities in honor of this event for hundreds of years. Pumpkins should be our national fruit. They were at the first Thanksgiving feast of the pilgrims and Indians in 1620. They were there at the first Independence Day celebration, long before Johnny Appleseed dropped his first seed. Sure, pumpkin fruit was not ripe during the Fourth of July. But, back then American ate more vegetables. This included pumpkin and squash flowers (get the recipe). Pumpkin leaves were also used in salads. Did you know?!? The Turkey was almost our National Bird? In a vote in congress, the bald eagle won out over the Turkey as our national bird. Had this happened, we all would be eating crow, err Bald Eagle for Thanksgiving dinner! Pumpkins are rich in Vitamin A and potassium. They are also high in fiber. The conclusion you should now be reaching is that they are therefore good for you. Your conclusion is absolutely correct.....until you start adding other ingredients that make up many pumpkin recipes. See Pumpkin Nutrition. They were once recommended as a cure for freckles. They were used as a remedy for snake bites. The seeds help avoid prostate cancer in men. Many recipes, among them Pie and Cheesecake, include eggs and whole milk(or half and half). In addition, the recipes sometimes call for heavy doses of salt. The end product is outstanding in taste, and all but taboo for today's cholesterol and salt conscious population. Check out our Cookbook for some of these recipes. Also pay attention to our recommendations to use less salt, and try salt and egg substitutes. Did you Know? Native Americans fed pieces of pumpkin to their horses. A sizable number of movies were made with pumpkin and Halloween themes. Most memorable perhaps is the pumpkin chariot in Cinderella. Copyright 1998-2019: Pumpkin Nook © By Premier Star Company.